Finally the day arrives. The mountain is too far away to leave home the same day, so on an hot Friday afternoon, Stefano and I, brothers in this madness, leave for Provence. The outbound trip, although by car (it would have been amazing by motorbike!) is very nice through different landscapes, from the familiar Monginevro Pass, down to the calm Embrun lake, through the Leoux canyon which seems a United States national park because of its wildness beauty with huge rock formations and clear river waters at the bottom of the valley. Right out of the canyons, or better out of the “gorges”, we see in front of us the region of Provence. If it weren’t for the road details and the cars, I would have been convinced to be in Tuscany, where I can see the same color hues with bright green vines and figs next to the light brown ground and houses in the little towns. The place is new but looks familiar, which makes everything more intense. 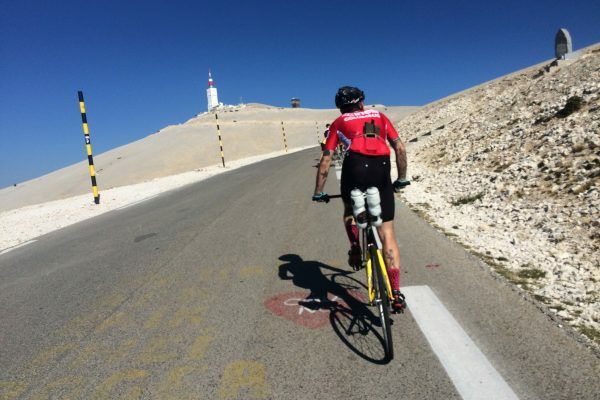 And at the end, after a turn at a roundabout, Mont Ventoux appears just in front of our eyes. It is almost night, but it is still sunny on the peak and makes the white even whiter and it is incredible how it is clearly visible the weather observatory on the top. Our trip continues and it is hard for me to focus on the road. The mountain seems to look at us and say: “Welcome, I was waiting for you”. In our suitcase there were two backpacks and (for the first time) two identical bikes, of the kind you can see in some pics of the Redhook criterium or in some videos of youngsters that are riding bikes out of their natural context such as the velodrome… Our idea is to climb the hardest side of the Ventoux and to descend the opposite side on two Cinelli Vigorelli: track bikes, one gear (47/17) and brakeless. To avoid the hottest hours, early morning we are on the go. The first pedal strokes are to warm up on a 10 km road with little traffic so we are able to feel the revolutions of our legs and our first impressions on our bikes. A short time afterwards we arrive in Bedoin, the town where we are starting our climb. We are careful but enthusiastic. 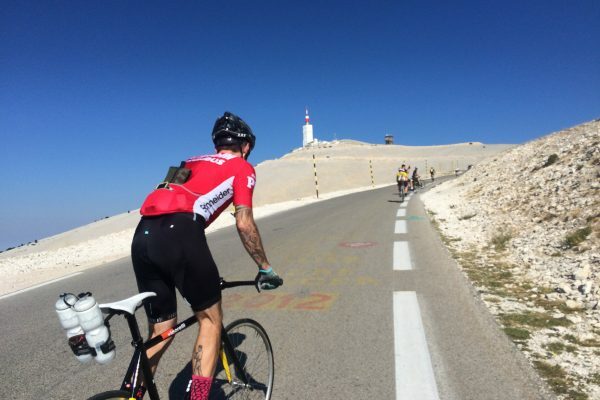 Sometimes we give a glance to our cardio to keep it under control and from the very beginning we see other groups of cyclists that are going uphill. 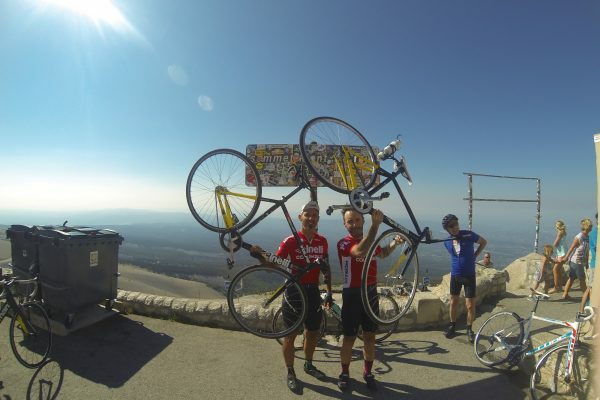 It is an ordinary Saturday and there are no special events, but I have never seen so many cyclists as today, coming from all over the world to challenge the big mountain. We overtake a few group and this fact give us more enthusiasm and slowly the rhythm (the cardiac frequency too) begin to increase.. to run into the first dramatic event, as often happens in the movies. With the last houses behind us, we arrive to a curve and get into a wood. They could have put a stele rock with written “Leave all hopes behind, you who decide to enter” … maybe in Occitane language, since we are in the core of this ancient region that now is transnational. After a few ramps, the dialogues between Stefano and I starts to decrease until disappearing completely. The road sloping keeps 9 – 11 % . The stroke counter of my Garmin does not give me any precise information under 25rpm but at this point everything is getting slower… everything but my breath! We mounted mountain bike handlebars to have more lever arm in the propelling phase. This helps us, but it seems not enough. Our thought is: “Is this uphill going to be so tough until the top?”. Anyway we don’t give up. We run into a couple that are carefully pedaling uphill. The guy sees us and tells his girlfriend: “If they do it on a fixed gear, you can do it on a roadbike!”. We gave them just an half smile, but it is a big incentive to stop us from giving up, with every pedal stroke becoming a piece of road to forget, focusing on what we’ve got in front of us. This time seemed endless, although it was just an hour and 15 minutes! We arrived to the chalet at the fork between the Bedoin and the Sault side. It is a kind of an oasis in the middle of the desert, destination and shelter for the wayfarers, most of them are on two wheels. At the hotel we were told that this was going to be the last place to get water and from there to the top there wouldn’t have been anything else. This place gave us back our motivation. The landscape facing us now is the opposite of the previous one. Entering a lunar environment, we are attacking the last six km to the observatory. From here on, the uphill is less rough and we see the top. Therefore, our pedaling changes. We are more serene and confident we will make it to the top somehow. Eyes and brain connect on a bunch of info: the perfect blue of the sky, the dark gray of the asphalt cutting through the white pile of stones in front of us, the landscape beneath us drawing our attention to the far away houses from which we started our journey, lost in the Provence countryside which seems so far away, and there is a red crest in the blue sky that seems to be painted with a spatula, as a cherry on top of the cake. We stop for sometime in front of the Tommy Simpson monument. 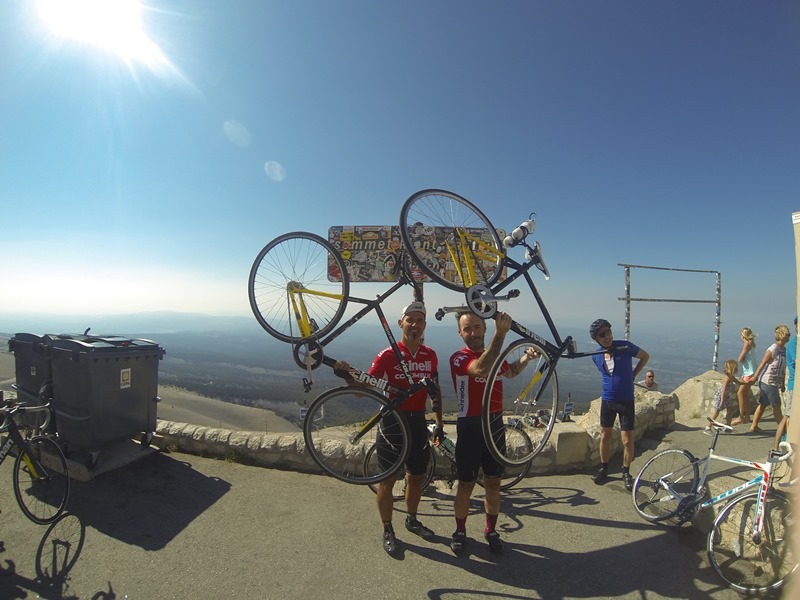 Then we concentrated on the last 1200 meters, with our minds already on the peak in order to get our legs and bike up there, under the legendary sign full of stickers. At the top, it seems a party . Some bikers congratulate us, some others were betting on our nationality while watching us go up, others looked at us as if we were aliens, without understanding we are just like them, although we just wanted to do something else because the simplicity of our bikes made us focus on somethings different from the type of shifts or the leg’s cadence. This climb got us to know us better, understanding once again the beauty of the connection between the sky and the ground. We see the couple we met in the forest. 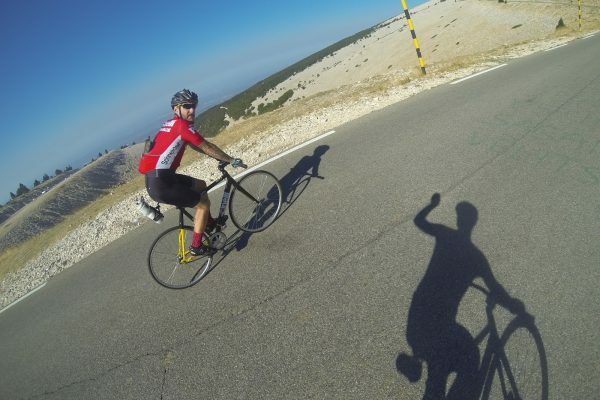 He comes from Tel Aviv and is studying in France; he is stunned seeing two track bikes up here and wants to take a picture! We explain him we are not pros or super athletes, we just do it because we want to experience something new and challenging while having fun. We continue our nice chat in a bar a few meters under the observatory. Finally it’s time to start our descent. We are very enthusiastic but we discover that also the side towards Malaucene isn’t so easy. As for the uphill, there are about 20 km with a 10% slope in the middle. Not documented in the elevation profile, the central part is paved with a very abrasive and dark bituminous mix which makes quite difficult skidding, to make the wheel behind slide and to manage the sideslip which slows down the bicycle speed. Our muscles begin to hurt and we need all of our coolness and technique to maintain everything under control. The point is that we are not two big heroes, but two forty year old family guys. Luckily at half our way through the terrain returns to be manageable. From that moment on, although tiredness adds on, we feel at ease with what we know how to do, to descend controlling the fixed gear bike, because going down hill by skids would have destroyed the rear tire and of course we didn’t have a team car following us to quickly change a clincher. Surprisingly, seven or eight of the numerous cyclists that overtake downhill, wait for us at the very bottom to congratulate us and ask many technical questions about gear, descend speed, pedal frequency and tires we used. We manage to communicate by hand gestures, and an odd mix of English and French. There are still a few smooth kilometers to get to a regenerating shower and a meal in our hotel room. The last part is quick and in the middle of the landscape, with the smell of grapes, figs, lavender and pine resin mixed by the wind (which has been very clement today). The temperature is quite warm, above 30 degrees. The trip back went by quickly. Sometimes I had to stop and ask my mate to drive because I suffered from cramps but nothing was new and I was ready for it.. Also the following three days were achy. Was it worth it? Absolutely yes! We came back from this journey a bit changed, as if the white of that mountain took away all the unnecessary and left us only the essential: friendship and the craving to pedal.